Marty and I are back from Australia, where we had a wonderful, relaxing holiday. We had reservations only for the first two nights, and that was because Melbourne was jammed packed due to the annual "Melbourne Cup"--a horse race that has become a national holiday. The rest of the time we wandered the countryside taking our chances on hotels and B&Bs, and we weren't disappointed. This is the first of probably a couple of posts, as we were there for nearly two weeks and every day was busy, though in a very laidback and relaxed way. One of the more interesting stops was near the beginning of our stay---at the National Museum of Wool, in Geelong just outside of Melbourne. The museum was very well done, depicting the history of sheep growing and wool gathering, as well as its creation into apparel and blankets in the country. Did you know that the phrases "by hook or by crook" and "on tenterhooks" come from this trade? A "crook" is a pen, and the phrase in the original sense means to corral the sheep by either penning them in or gathering them with a sheepshook, and we saw actual tenterhooks--where the wool is stretched to straighten the grain. There was also a video of a man shearing a sheep, in something under 40 seconds. Quite an operation. 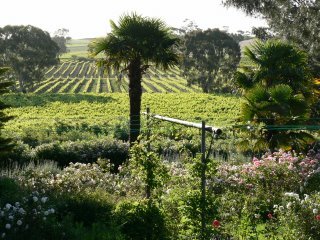 Our travels took us to Adelaide and the Barossa Valley, which is the original wine country of Australia--in fact I first had Australian wine and cheese in Japan over 25 years ago, and both came from Adelaide. 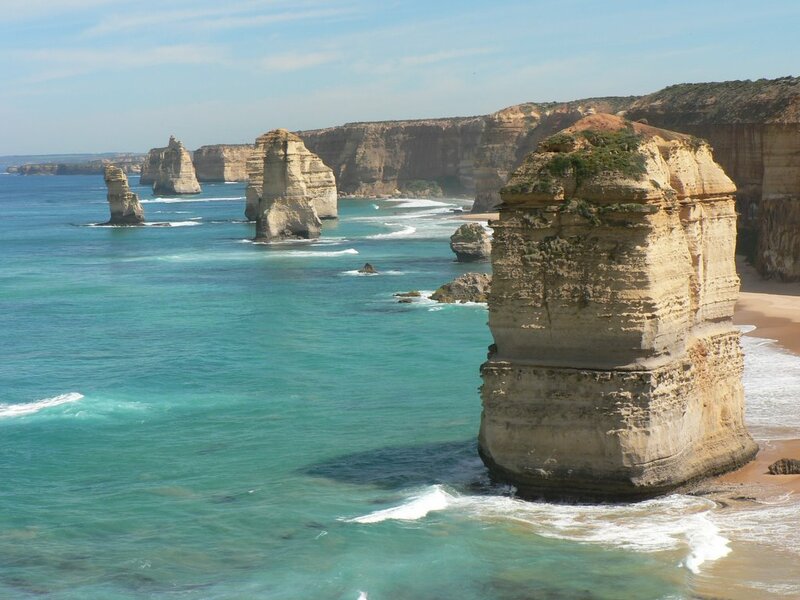 On the way to Adelaide, we travelled along the Great Ocean Road, with the famous "Twelve Apostles" (down to 11 with the collapse into the sea of one of them this summer). 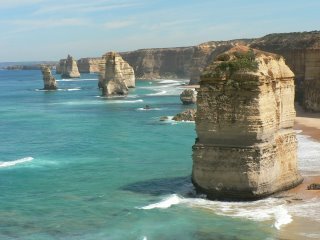 This is one of the most famous scenes from Australia, and it was a sunny morning when we stopped there, so both Marty and I got great pictures. About an hour north of the end of the Great Ocean Road is the Coonawara Valley, the first of the wine areas we stopped at. You may know the Coonawara from Jacob's Creek, which is widely sold in the U.S., as well as from Penfold's, which has some vineyards there as well. However, the best wine we found came from the Barossa. 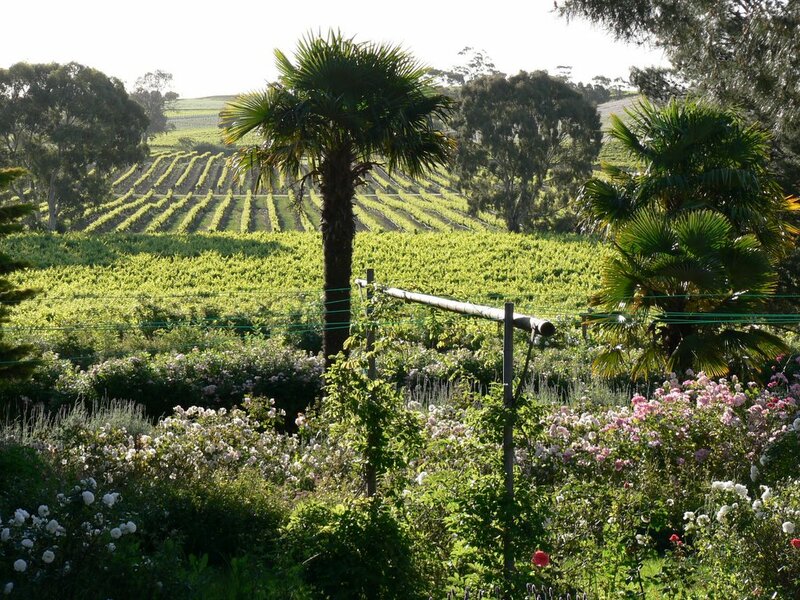 We stumbled on a motel/restaurant/vineyard called Chateau Barossa that had fabulous views and, as an added bonus, over 25 acres of roses of all varieties. As it is springtime in Australia, virtually all of them were in bloom. Below you can see the view from our window---rows upon rows of grapevines in the background. Both of us loved the visit to the Penfold's estate--just outside the city of Adelaide--with the original homestead of Dr. Penfold, the founder of Australia's most famous wine. We were able to take a tour of the old cellar, where French and American oak casks of Penfold's premium "Grange" wine (starts at about $200 per bottle) were waiting to be bottled in the fall of 2006. Like many of the wineries in the area, Penfold's offered not only a tasting counter but "cellar door wines" , which are sold only on the premises. From the various wineries we visited, we brought back our 2-liter allotment to India, and will enjoy sharing them with friends. Hi there. I'm interested in argentinian red wine and would like to get some local help & advice. I've met some local people via this argentinian red wine site but do you know of any others where I can meet local people?